Teeth can get stained or discolored from external sources such as intake of colored beverages, cola, red wine, tea, coffee, acidic juices. Thus, stay away from certain food colors in your meals, excessive use of some mouth washes as well as from internal sources such as side effects of antibiotics during development time period. Because there is an incorporation of fluoride through water or milk, remnants of chemicals left in root canals during treatment procedures and pulp tissue death due to trauma or injury. External stains can be easily removed with the help of regular tooth brushing and mouth rinsing in their soft form. This can be eliminated by professional teeth cleaning procedures. These include scaling and polishing in the dental clinic because the stains are harder and stickier. Internal resistant strains cannot be removed by simple prophylaxis or teeth whitening protocols. Thus, they need more invasive dental treatment approaches such as veneering, dental crowns and laminations for masking the unsightly appearance. These procedures make it necessary to remove healthy natural tooth structure from the front tooth areas visible during smiles. Albuquerque New Mexico 24 hours emergency specialist cosmetic & restorative dentist Dr William C Gardner at NM Family and Cosmetic Dentistry PC offers one of the least invasive options for removal of hard resistant staining and discolorations in the form of micro-abrasion of affected teeth. Because of such dedicated services, we are highly popular. So, give us a call to fix an appointment or to know more. Q. WHAT IS MICROABRASION OR ABROSION OF TEETH? 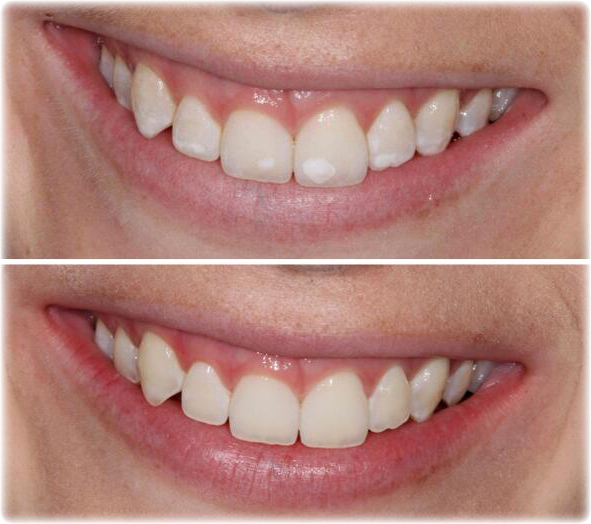 A. Micro-abrasion or Abrosion is usually the term for specialized cosmetic dentistry procedure. This involves the removal of small portions of defective tooth enamel. The next step is esthetic treatment by certain erosive chemicals. The collection of abrasive action by dental drills and erosive action by acids gives it the characteristic name abrosion. These processes perform superficial de-mineralization of the discolored enamel layers. Thus, in the process its optical properties making the surface no-reflective as well as non-refractive leading to masking of underlying stains and discolorations. So,the process is quite effective and common. Q. WHICH TECHNIQUES ARE EMPLOYED FOR MICROABRASION OF TEETH? • The second technique involves phosphoric acids in combination with pumice for teeth whitening because it is quite effective. Q. WHICH SITUATIONS CAN BE TREATED WITH MICROABRASION TECHNIQUES? • Discolored root canal treated teeth. Q. WHAT IS THE PROCEDURE OF MICROABRASION IN THE DENTAL OFFICE? A. Dr William C Gardener at Albuquerque New Mexico will take complete medical and dental history followed by thorough examination of teeth. The patient signs a consent after explaining the whole treatment procedure. Your teeth is clean and gets a good wash with pumice and water. After drying the teeth and surrounding tissues, rubber dam is there for the protection of gums, adjacent teeth, tongue and soft tissues in the mouth. Approximately 18% HCL or 35% phosphoric acid with pumice slurry is in use in 5 second cycles for 8-10 times to remove discolorations and stain marks. Thus, the frosted enamel stains go away with drilling finishing burs or extremely slow speed rubber cups. Abrasive pumice slurry with acids peels off the superficial stained enamel layers. Fluoride gel is of great use after the procedure because of its constituents. The surface gets a good polish with soft discs and rubber cups because of the modern technology in use. There will be follow up visits depending upon the condition or the result. Thus, the entire process is quick and without hassles. A. The whole procedure will take approximately 45-60 minutes for providing the best outcomes. Because time is often a concern, Dr. William ensures that there are no delays. The procedure offers optimum durability. Slight up appointments like bleaching is often necessary during follow up examinations. Q. IS THERE ANY SENSITIVITY OR PAIN FELT AFTER MICROABRASION OF TEETH? A. Slight sensitivity happens with these procedures because of numerous reasons. It is possible to tackle this problem with fluoride applications after completion of treatment visit. You can use de-sensitizing tooth paste and mouth wash as well. So, the process is quite simple – thus, get in touch with your Albuquerque New Mexico dentist right away. Do you have cosmetic defects in your teeth? Is it making your smile less pleasant? Is this owing to decayed, missing, crowded, crooked, mal-aligned or mal-posed teeth because this is a huge anxiety for many? You can visit your 24 hours emergency Albuquerque New Mexico dentist Dr William C Gardner. Book an appointment at NM Family and Cosmetic Dentistry PC. Call anytime because he is available throughout day and night. He focuses upon best solution for improving your dental and oral health conditions because he believes in offering the best services.